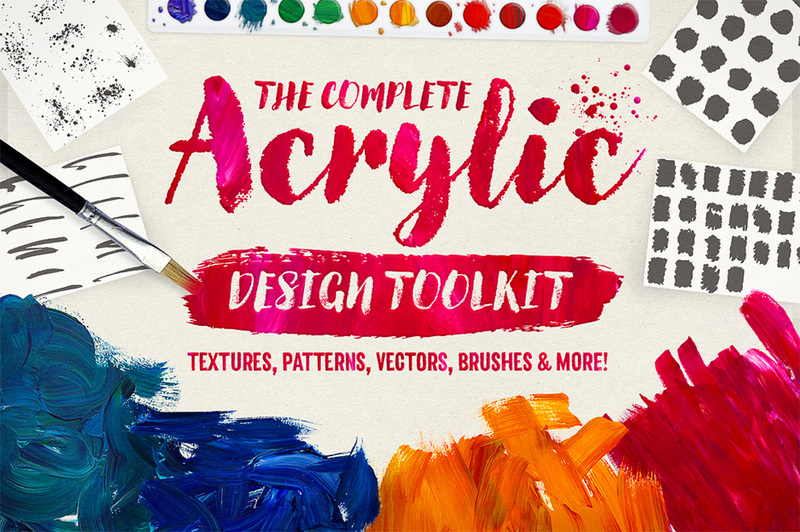 We’re so excited to announce the launch of our latest product – The Complete Acrylic Design Toolkit. This pack is hugely extensive, and gives you everything you need to add some artistic flair to your next design project. We teamed up with the mega talented Chris Spooner who you may know from his incredibly popular blog, his amazing design tutorials, or his awesome Youtube channel. Chris has put together this exceptional pack, specially for the Design Cuts community. 17 acrylic textures (includes transparent .PNG versions) ready to be dragged and dropped into your work. 20 totally seamless styles and patterns. Isolated paintbrush graphics, to create your own realistic artistic scenes. 25 high-res, super detailed Photoshop brushes. Dozens of hand-drawn vectors, including brush strokes, underlines, circles, splatters and texture shapes. An easy-to-use smart .PSD effects pack, so that you can simply drop in your work and customise the acrylic paint goodness. This includes a handy video guide to walk you through how to get the most from this awesome effects pack. Chris has also put together a brilliant video tutorial, giving you for how to work with your new resources. So that’s The Complete Acrylic Design Toolkit. An amazing collection guaranteed to inspire your next artistic project. What will you create with it? The acrylic paper texture, seamless pattern textures, and isolated acrylic textures are .PNGs/.JPGs format. These should be compatible with most graphics softwares, including Photoshop, Photoshop Elements, Paintshop Pro, Corel Draw and more. The Photoshop brushes are Photoshop compatible at version CS5 and beyond. The layer styles/patterns and smart .PSD: Photoshop CS3+ is required. The vectors: .AI files: Illustrator CS3+. The .EPS vectors should be workable in most mainstream graphics softwares, including Photoshop, Photoshop Elements, Paintshop Pro, Corel Draw and more. Software compatibility: .JPG and .PNG and .EPS files will work with most graphic softwares. PS Brushes require Adobe Photoshop CS5 and newer. The PS styles, patterns and Smart .PSD will work with Adobe Photoshop CS3 and newer. .AI files require Adobe Illustrator CS3 and newer. File size is approx 760.1MB (1.04GB unzipped), offered as a single download, as well as a 4 part download. i’m absolutely loving the quality work put into this bundle! thanks team! I do have one question though regarding the photoshop brushes. I’m a newish user to PS and i think i have a good handle on the difference between tool presents and the brush presets. How do i make the brushes in this pack work as a flow (rather an an individual image)? they don’t seem to work to well visually for me straight from a fresh install when used without any specified presets. is this something i have to customise myself, or am i missing something? sorry if my meaning is unclear. Thanks so much for you comment and the awesome feedback, we really appreciate you taking the time to let us know! You are new to PS and I am new to DC 🙂 rest assured I can certainly help you with this! I have just popped you over an email to get a bit more information from you. Thanks for getting in touch, I am so sorry to hear that you are having an issue with the smart PSD in this pack. Rest assured, I am on the case! I have sent you a quick email to get some more information from you and help get you up and resources. I hope it helps, and please don’t hesitate to contact me should you have any other questions. I’m here to help! I really hope you enjoy your awesome new Acrylic goodies. If you have any questions or queries please do let me know, I’m here to help! Just purchased this toolkit. I am currently on Mac and PC platforms (haven’t been on PC since 2004). Did I miss something that would clarify the installation of the brushes? Thanks! Thanks for getting in touch and thank you for your purchase! I really hope you enjoy your new resources 🙂 I can certainly help you with installing your brushes! I have just sent you an email to get some more information from you and assist in getting you up and running with all of your new items! I hope it helps, Greg, and please don’t hesitate to contact me should you have any other questions. I’m here to help! How useful is this with Illustrator? I know some of it is usable in Illustrator but I’m wondering how much of the flexible design options are available without Photoshop. At this point, in addition to Illustrator, I only have an older version of Photoshop Elements but many things don’t work with Elements. I’ve sent you an email to go in to more detail about this. I hope it helps, and please don’t hesitate to contact me should you have any other questions. I’m always happy to lend a hand! I’m pleased to report that this is a completely standalone product that has never featured in any of our previous bundles. I hope this helps, Kelvin, and thank you so much for your incredible support! The whole team & I really appreciate it 🙂 please don’t hesitate to contact me should you have any other questions. I’m always happy to help! Very.. cool… very, very cool! THANK YOU! Thanks so much for leaving such an awesome comment and for your purchase! I love this pack! This was a no-brainer for me to purchase, once again Design Cuts you have done it again. I am thrilled you have joined efforts with Chris Spooner. He provides amazing resources, and this product is sure to be a go-to for me when working on projects. Thank you DC + Chris Spooner for inspiring me to create new designs. We are really excited to be working with Chris on this one and even more excited to share it with you. We really hope that yo get loads of use out of it and have great fun working with it! I am so sorry to hear that these brushes aren’t working for you! Would you please send me the same email? I am also getting error messages when I try to load the brushes in PS 5.5. Thank you! Hi! I am also having issues with .abr file not being able to be read in CS 5.5. All other items in pack work (and look) great! Thanks! Thank you for your comment, I am so sorry you are having an issue with the .abr files. Rest assured, I’m here to help! I’ve sent you an email to get some more information from you and investigate this further. I hope it helps, and please do let me know if you have any other questions or queries. I’m here to help! Great launch! Fantastic product. Cheers to DC Team and Chris Spooner for bringing this pack together. Hitting the .. ATC (Add-To-Cart) button now. (Haha I was looking for the BDN button). Thanks Iskandar, I hope you have fun with it! Oh pls don’t ever stop your large file downloads for those of us on faster connections! Pls add smaller for others. I LOVE the big downloads! I thought I’d lose my mind when I bought files from a variety of scrapbooking sites a couple years ago. One bloody file at a time, from one package of many files. I had the hardest time keeping track of what downloaded!! Although I clicked, some just didn’t kick in. AND because files are often named very differently than the download package, it’s really time consuming to match what downloaded vs what still to download. Pls remember some of us CAN handle the big files. Big and small, pls and thanks!! Love ya all. I can completely appreciate that only having the individual links could be quite time consuming so rest assured we won’t make these compulsory as we could all be here all day! But still had been trying to download 3 files of the big bundle at 1+ gig each and download keeps failing and im running out of data allowance for this month. So have to wait till next month to try to complete it. Thanks for getting in touch with some lovely feedback! I am really sorry that you are experiencing issues with your recent bundle purchase. I have just sent you over an email to see if there is anything i can help you with in regards to this. Awesome! And such a great price as well. Love Chris Spooner’s work! Thank you for your kind words Lisa! So amazing! Ditto splitting the download into two or more, this always helps! Thank you so much for your awesome comment, I’m really pleased to hear you are liking the look of this pack 🙂 I’m pleased to report that we have now divided up this item into smaller pieces along with the complete download to help you get up and running with your resources faster! I hope this helps, Morenike, and thank you again for your comment! If you ever have any questions or queries then please do let me know. I’m here to help! Thanks again for getting in touch, Cindy. If there is ever anything I could assist you with please do get in touch. I’m always happy to help! I am using Photoshop CS5 and the brushes will not load for me either. Could there be another reason I am running into this issue? Thank you so much for getting in touch! I’m so sorry to hear that you are having some trouble with your brush files! I’ve just sent you an email to investigate this further and help get you up and running again. I hope it helps! It could be that the brush sizes are larger that 2500 pxl limit that some versions of PS have. One image on this page mentions up to 5000 pxls. Love what you guys offer, but PLEASE CONSIDER breaking down the size of the download into smaller packages. This will help many of those on slower ISP. Thanks for getting in touch with your feedback, I really appreciate you taking the time! I’m really pleased to say that we have now split this pack into smaller sized pieces to make it easier for you to download 🙂 I really hope this helps, TG, and thanks again for your feedback! Please don’t hesitate to contact me should you have any questions or queries. I’m always happy to help!